The Risotto Plus™ comes with some special features. Sauté setting. – The Risotto Plus™ allows you to sauté evenly in the bowl of the rice cooker for an thorough sear and coating on the meat. It seals in moisture and intensifies flavor. Risotto setting. – The risotto setting takes away the work of constant stirring and automatically agitates the rice. 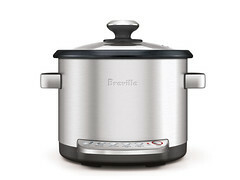 Slow Cooking – the Risotto Plus™has two different slow cook settings, Low and High.